How do you win clients online? You show off your knowledge. Authority alone doesn’t win you clients. As social media expert, for instance, understanding social media isn’t enough to win you clients. Thousands and thousands have similar knowledge, similar expertise, and similar skills. To win business online, you need to use your most precious asset–your personality. 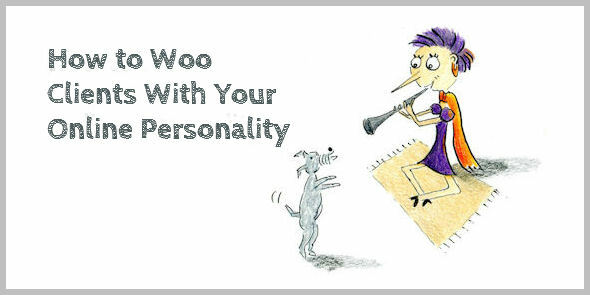 Because your personality helps you stand out online, woo clients, and win business. Answering the question, “What do you do?” always seemed easy. As a product manager, I managed products. As a marketing manager, I ran marketing campaigns. As a sales and marketing director, I directed a sales and marketing team. Nope, it’s a big mistake. In other words, it’s not so much about what you do, but how you do it. When I look back at my career so far, I see a common thread: Unhappy to follow the beaten path, I always changed the way things were done. As product manager, I didn’t add value by simply managing products. I grew market share by generating new product ideas and by finding ways to develop products faster and cheaper. I’m not good at following rules and listening to a boss. I rather do things my own way. To find your added value, look for the common thread in your career. If you struggle to find it, I recommend you take Sally Hogshead’s Fascination assessment. It helped me a lot. That’s what my friend and Dutch professional blogger Kitty Kilian told me in my early days of blogging. I was naive. I thought I only needed to share useful tips. But thousands of bloggers share tips about copywriting and business blogging. Simply sharing tips made me a commodity–easily interchangeable with any other blogger. The only way to stand out is to have a unique voice. To use your personality’s unique advantages. In her book, Sally recommends defining an Anthem by picking an adjective and a noun. For a Maverick Leader (like me! ), this could be Pioneering Ideas or Irreverent Creativity. As you’d expect from me, I’ve not quite followed her approach. Inspired by her assessment, I defined my personality and online presence as irreverent and bold with a focus on simplicity. How would you describe your personality in a few words? How does your personality add value? Complete strangers don’t do business together online. Clients want to get to know you and like you, before they part with their precious cash and ask you to do a job. So you need to let your personality shine through your online presence. And do this consistently. You can’t tell me you’re a meticulous fact checker, and then have a spelling error in your Twitter bio. You can’t tell me you’re creative, and then have boooooring stock photography on your site. What does your web design tell about you? Taking blue as a brand color, for instance, is a safe option. Nothing is wrong with going for safe, but it doesn’t suit me. So I went for purple and orange. A bolder choice–not everyone likes it. But that’s fine with me. I don’t need to please everyone. What impression does your web design make? How does it reflect your personality? If you’re struggling with this, sign up to Pamela Wilson’s marketing tool kit which explains the basics of design (and it’s free). You see the same images everywhere, don’t you? Clichéd. Bland. Unbelievably boooring. And completely devoid of personality. I’ve been spending the last year learning how to draw. Because I wanted to create images that were completely unique. But you don’t have to go that far to let your personality shine through. You can use Canva to create your own images. Or you can find unique sources for stock images that don’t look like the same stock photography everyone uses. Demian Farnworth creates a strong impression with stock photography on his blog the Copybot. Check out his advice in The Misfit’s Guide to Finding Interesting Images. You might also want to listen to his Copyblogger podcast with Jerod Morris about selecting images. Before you decide to follow or circle someone, you check out their profile first, don’t you? Apart from the meaningless hashtags, that profile doesn’t sound like me, does it? It’s rather run-of-the-mill. Irreverent marketer and copywriter. On a mission to stamp out gobbledygook and to add sparkle to boring business blogs. What’s your mission? What does your bio tell us about you? How many blogs sound drab? How many corporate websites sound inhuman? Robotic? Utterly boring? As a small business owner, you don’t have to appeal to the masses. You can charm potential clients with your voice. You can find the clients who love working with you because they like who you are, not just what you do. Consider your word choice. Are you using strong or flowery language? Do your words express you’re streetwise or erudite? For further guidance, check out my short tutorial How to Infuse Your Brand Voice With Personality (published on BigBrandSystem.com). Have you noticed how I told you teeny-tiny stories about myself in this post? I shared how I re-invented the product development process in my early career. I explained how I chose bold colors for my site. I told you my early blog posts were devoid of personality, and how Sally’s test helped me find my voice. As soon as you abandon the idea that you’re simply sharing tips and building authority, you’ll find opportunities to share personal mini-stories in your posts. That’s how readers get to know and like you. That’s how you build trust. And that’s how you win clients. For further guidance, check out my blog post about How to Tell Itty-Bitty Stories to Engage and Entertain Your Readers. When I started blogging, I was afraid to show myself. I thought my life was plain and boring. Who would be interested in hearing more about me? But in a world of incessant twittering, where a like has become meaningless, we’re all looking for the human touch, for real voices. In this world of pixels, we’re all looking for personal connections. Don’t try to please everyone. Don’t hide yourself. Yep, you can have plenty of personality, and still sound professional. Thank you for yet another post packed with good advice. I’ll be looking into those links too. They sound yummy. Yep, that’s a good quote! Always good to see you, Bart. Excellent post. Definitely reminded me to add more of my personality to my writing. Yes, as a photographer & blogger, you need both a visual and a writing voice. Go for it! Thank you for stopping by, Lucrecer. Wonderful post and theme Henneke … your most precious asset is your personality. I’ve found time again that many people are unable to express their personalities in their writing. The result is a non-alignment with their social media persona. Interesting, this is laid bare when it comes to participating in Google Hangouts On Air. If you’re not your natural self, you’re lack of authenticity is glaring. Yes, that’s an excellent point you make, Mark. You might be able to hide yourself in your writing or pretend to be a completely different person, but this is much much harder to do in a face-to-face setting like a Google Hangout or a meeting in real life. Thank you for stopping by, Mark. There is safety in blue websites and vanilla ice cream, and that’s where I’ve been stuck. I need to put on my big-girl pants and move on! As always, you are enlightening…looking forward to your webinar on Friday with Sonia! Interesting that you mention vanilla ice cream as Sally mentions it in her book, too. She suggests that while nobody hates vanilla ice cream, nobody loves it either. It’s a crowd pleaser. Far fewer people like pistachio ice cream, but the people who like it, absolutely love it. I’m one of those people who are afraid to show their personality because I feel (liked you mentioned) that my life is plain and boring and so I have no “stories” to tell. I’m also a very private person and hestitate to talk about what’s going on in my life. But I will definitely heed your advice and start working on my personality. Like you, I’m a private person, too. You won’t see me exchanging gossip on social media sites. I rarely share details about my personal life on Twitter or G+. I don’t even have a Facebook account. But what I’ve learned is that nobody’s life is boring. We all have stories to tell. Whether it’s about a cycling trip, or how we set up our website. And I’ve slowly become more comfortable with sharing more about myself on my site–never as an aim on its own, but always as part of a tutorial, either as an example or as a metaphor. We all have to set our own boundaries of how much we want to share. Try to find some simple ways to drop a few hints about who you are in your blog posts. There’s no need to have a tell-all. Ironically, just getting up the nerve to tell people that you feel your life is boring makes you more likable and interesting. I hate reading crap from self-important snobs that makes me feel like I should just go back to bed since my life isn’t interesting like theirs. I want to read stories like yours, Mellie. Stories that I can relate to and touch my heart. After all, we’re all a part of this human condition. I totally agree with you – we want stories we can relate to; not crap from self-important snobs. Henneke, you can say this a thousand different ways, and I’ll never grow tired of hearing it. Nor will I ever fail to pick up a useful technique. Beneath the surface of the roles we all play, we’re vulnerable beings, hoping to make meaningful connections with one another. Enchanting language, from the heart, makes it possible. As you’ve discovered, no amount of logical persuasion can equal the power of your true personality. Thanks for sharing your journey. And, since you have such a natural talent for writing, thanks for sharing your methods as well. Logical persuasion is surprisingly limited, isn’t it? I appreciate you’re stopping by again! I just went and ordered Sally’s book. Thanks for letting me know about her. The test is surprisingly accurate, isn’t it? I hope you’ll enjoy the book! Scarily accurate! And it’s good to be back! It always seems that after I read one of your posts I have so much new work to do! That’s a good thing. Thank you! Life is never perfect, and you can implement things like this step by step, and let things evolve naturally. Thank you for stopping by, Melinda! Thanks for this valuable post Henneke! I struggle to include my personality in my posts, but when teaching my classes the participants mention it often in my evaluations. I need to work on weaving that into my writing which you do so effortlessly. Thanks for sharing your methods so we can learn how to be better writers. Software training is often perceived as dry, drab, and boring, so you must be doing an excellent job with your classes, Marie! We often see writing as a completely different discipline from standing in front of an audience, but many similarities exist. How can you use your classroom experience to infuse your blogging with your personality? Which elements can you replicate? “Irreverent and bold with a focus on simplicity” is a nice personality description. From what I’ve seen through your writing, it describes you quite well! I meant to say this in my earlier comment, but I love your web design. Orange has always been one of my favorite colors to use as a web designer. Honestly, the only reason I didn’t use orange with Be A Better Blogger is I’ve used it so much on previous projects! Glad to hear you like my web design. I have no PhotoShop skills, so someone helped me create the logo, but I selected the colors and fonts myself. I enjoyed it. I’d say this is classic Henneke: “When I started blogging, I was afraid to show myself. I thought my life was plain and boring. “Who would be interested in hearing more about me? I have taken Sally’s assessment. Thanks so much, Ms. Henneke. When something has been holding me back, then it might perhaps hold other people back to. So why not share it to help others? Your post sparkles, Henneke. I’m marinating in it for a few days, as I do all your posts. It takes a while to soak in, especially adding in the links. And … I just got Sally’s new book in the mail yesterday from Amazon. So hello Summer Reading! Then the hard part … putting it into practice. Thanks again for your online mentoring to so many of us. It’s appreciated. I hope you’ll enjoy reading Sally’s new book! I like that you use the word “mentoring”, as this is exactly how I define my role as blogger – a mix of tips, inspiration, and sometimes a “virtual arm around people’s shoulders”. Interesting read. I agree with you, but what if one’s personality doesn’t resonate with a large audience? That’s the dilemma I faced when I ditched my old website because it was so phoney it bored even me. I decided to replace it with a site that reflected my age (66), my lifestyle (an American/Australian expat living in Cambodia) and my rather unusual worldview. I’m a freelance writer and one of the messages I’m trying to convey is that I never found a magic formula for success. I started at rock bottom and have crawled my way up simply by having no choice but to stick with it and constantly look for ways to improve. I’m still crawling, but now I at least get to stop and enjoy the view now and then. It’s not really what readers want to hear, but it’s the true story I have to share and feels better than my old approach. Do you need a large audience? Companies like Target or WalMart need a large audience because their business is based on large volumes and low margins. As small business owners, we can often look for the audience that resonates with us. Of course, this doesn’t mean we can just write about what we want to write. In business blogging (unlike in fiction writing) we’re not the heroes of our stories; our audience are the heroes. We should inspire them with our stories. The purpose of your blog should be at the crossroads of what your ideal reader wants to read and what you want to write about. Thanks very much for your thoughtful reply. I’m not really a business blogger, but like to see that people have been reading my blogs. My other blog, Sihanoukville Journal, ranks well on Google and gets a decent audience. Just finding my way with my new blog. I appreciate what you say about being “at the crossroads.” So far, I think I have been a little too self-indulgent in this new blog. You are very good at breaking down (otherwise complex) information into easy to digest chunks. I have been study a lot of the older Gary Halbert material of late. He was very good at copywriting, but I expect you knew that already? Warm wishes from very hot ‘n’ sunny Tokyo. Thank you, Scott. I do try hard to make things as simple as I can. Gary Halbert is one of the few legendary copywriters whose writing I haven’t really studied yet. Thank you for nudging me! PS I’d love to visit Tokyo one day. Great post. I’ve always known that personality is important, it’s translating that knowledge into actual personality online that’s the tricky bit. It’s something that I’m constantly working on. Your blog post contains very helpful ideas. Your point 2, Images, is particularly relevant to me. I had been using free images from various sites or posting without images then, inspired by you telling us that you are learning to draw to add your own images to your blog, I thought ‘well I can do that’. I now write my blog post, and the last thing I do before posting is to draw an image. My main criteria are that it has to be bright, lots of colour, humorous where possible and take not longer than an hour to complete. I don’t know why I didn’t think of producing my own images before you put me on to it. The best bit is, it’s great fun! Nice images, Kevin. Do you draw them digitally? What program do you use to draw? This has made me realise I have been holding back on unleashing my personality, but this post has inspired me to give it a go! Sally’s site really helped me last month; it gave me clear understanding of what I have to offer my clients, and I noticed it aligned with what they had said about my services and value when I asked them a year ago. These things help so much in defining your brand and voice! I once ran a workshop for professionals on creativity where everyone had to celebrate the weirdest thing about themselves. Amazingly several people had the same weird thing, and most only thought their own weirdness was truly weird. To Express it is the Art. Thanks for saying it. I love the idea of celebrating weirdness. That’s a great idea for a workshop. Thank you for sharing, Carole. Everyone in our office at Unbounce is doing the Fascination Assessment now 🙂 Thanks for providing that! I love the approach of focusing on who you are rather than what you do. Very insightful. That’s a great way to use the assessment, and to get everyone to understand how we all communicate different ways. I learned so much from this. Sally’s book talks quite a lot about building teams based on everyone’s Advantages. Hi Henneke, I adore your writing and messages. I went to Sally’s link to the “invitation only” page, but the form asks for a book code. Does this mean I need to buy the book first and enter a bar code? Thank you. You don’t have to buy the book. In the field for bookcode, you simply enter the code “hduistermaat” (without quotation marks). Thanks Henneke, your post was exactly what I needed to get my latest blog finished. (Me again. I guess those internal links really “do” work.) Thanks for the link to Sally Hogshead’s fascination report. Very interesting and much better than many of these types of things. I got Mystique+Innovation, and I’m the Secret Weapon. I think it’s high time I started living that out louder. Huzzah! I agree with you – Sally Hogshead’s Fascination report is really interesting, and it can help us understand ourselves (and others). And perhaps I should add links at the bottom of my posts more often? Nowadays if a visitor fall on your website, first thing he will notice is how attractive and catchy is your web design. Then probably he would like to find out some testimonials of your past clients. So testimonials play a vital role and help gaining some confidence. The second thing you should worry about is your presence on social network. If you have a good number of followers on your Twitter, Facebook and other social accounts, then it will be more beneficial for you. Thanks Henneke for the insights you shared wit us. Yep, testimonials can play a big role – but only if they’re not too sugary. I often skip testimonials when I browse websites because they don’t sound real, they sound over-the-top positive.